You may have missed it, but on Tuesday night the Blue Jays third baseman did something so incredibly stupid that he got himself suspended four games by Major League Baseball. After striking out looking on two consecutive borderline strike calls (one of which he darted to first base, thinking it was ball four) the 22 year old Brett Lawrie threw his batting helmet at the ground and towards the home plate umpire, Bill Miller (click on the above picture to see it in action). Unfortunately for Lawrie the helmet bounced up and hit Miller in the hip, resulting in an automatic ejection for Lawrie. His manager, John Farrell was also ejected on the play after both continued to argue with Miller to no avail. This was the first ejection in Lawrie’s career (he’s in second season with 12 home runs and 42 RBI’s in his 81 Major League games), and hopefully this will be the last time that one of the game’s best young players makes contact with an umpire. 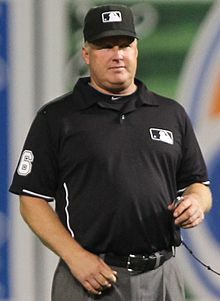 Bill Miller has spent the past 15 years umpiring MLB games. Tuesday night Lawrie disagreed with him. Baseball is the one sport in which players are allowed to argue with officials, as long as they aren’t debating balls and strikes or use some of the “magic words” that intimidate or belittle the boys in Blue (who happen to wear black now, but that’s a different story). It takes very tough skin to become an umpire in baseball, especially at the Major League level where every game you will see players questioning an umpires call, and not always in the nicest terms. A lot of players think the umpires are jokes and don’t deserve to have such a great such a great view of the action, while a bunch of umpires think that the players are prima donnas and don’t deserve the millions of dollars that they make annually. While there are a lot of excellent umpires, as with any position of any business there are a bunch of individuals who would be better off watching from home than suit up to official a baseball game. Of course players have no impact on the choosing of umpires, so all that they ask is that the men in charge are consistent, if not perfect. On Tuesday night, Brett Lawrie thought Bill Miller was neither perfect nor consistent. If you have played baseball (or softball) long enough then I’m sure there have been times where you have disagreed with an umpires call. There have probably also been times that you have argued with an umpire and gave him a piece of your mind. But Brett Lawrie tossing his helmet, as innocent as it was meant to be (as I don’t believe he tried to hit the umpire with it) crossed the line and he deserves all of the four game suspension that he received from Bud Selig’s office. Over the course of the 162 game regular season, the suspension and the undisclosed fine he received really don’t mean that much to Lawrie personally but it may be a hit to the Blue Jays who need to find someone to fill in for him for tonight’s game against the Yankees and then three games against the Mets over the weekend (Lawrie appealed his suspension and played in last night’s win for the Jays, but dropped his appeal this afternoon). In the bigger picture hopefully this suspension will show Lawrie and every other player in the game that umpires do have rights, and if you disrespect them there will be consequences. Probably a lesson that these guys should have learned before they reached the professional level, but hey, what can you do about some of the athletes that have been coddled their whole life and barely told no. This entry was posted in MLB and tagged Baseball, Bill Miller, Blue Jays, Brett Lawrie, MLB, Sports, Toronto, Umpire. Bookmark the permalink.